Red-billed Quelea, Range-change map between SABAP1 (1987-1991) and SABAP2 (2007-current). 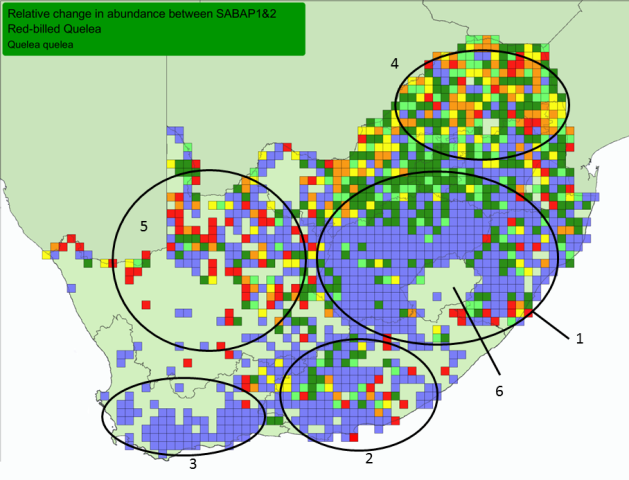 In South Africa the Red-billed Quelea has many more grid cells with increases in reporting rate than cells showing decreases, between SABAP1 (1987-1991) and SABAP2 (2007-). 1. Free State to southern KwaZulu-Natal. 2. Western part of the Eastern Cape. 3. Most of the Western Cape - this is a range expansion in recent decades. 5. North-West Province and the Northern Cape - mixed results due to poor coverage - more atlasing needed! 6. Lesotho - occurs at low density; SABAP2 coverage too low for meaningful results. Exotic populations established in foreign countries, eg Spain, Oman, Reunion: Appendix of Dyer EE, Redding DW, Blackburn TM. 2017. The global avian invasions atlas, a database of alien bird distributions worldwide. Nature Scientific Data 4 no: 170041.